A week of inclement weather didn’t stand in the way of our school prefects as they brightened smiles across the Trinity College School campus during Spirit Week. Beginning on Monday, January 21st, the prefects hosted five days of fun events and non-uniform days to help chase away the “January blahs”! Monday was “Encouragement Day,” when students had the opportunity to write sticky notes with uplifting messages that were then posted on the fireplace in Cirne Commons for all to see. Students and staff could also grab an “encourage-mint” on their way through the commons. Being a slow start day, Tuesday saw Senior School students follow a more leisurely morning schedule. With the chance to swap out their uniforms for a pajama non-uniform day, students also had the opportunity to head to Cirne Commons in the afternoon to watch Ferris Bueller’s Day Off. 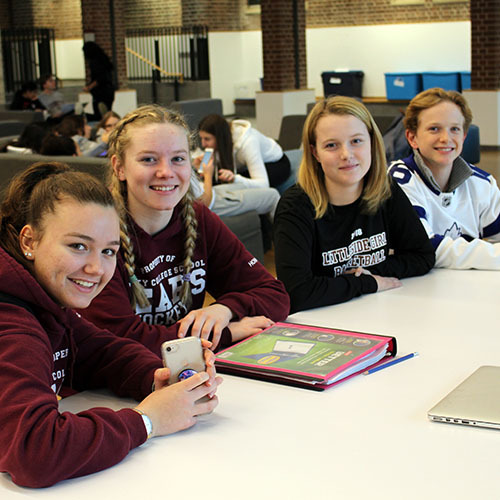 Wednesday, students donned their favourite team jerseys for “Sports Day,” which featured an amazing “game party” lunch with jalapeno poppers, pork bites and poutine, and a sports jam event in the Wright/Orchard House Lounge following evening study. A time-honoured TCS tradition was the highlight of Thursday’s activities, as Senior School students learned in chapel that first period would be cancelled to make way for Winter House Olympics. Students headed across the street to the Peter Campbell Memorial Rink to take part in a series of hilarious and challenging on-ice games. They also enjoyed a treat of hot chocolate and cookies during the games. Thank you to the prefects for organizing a great week of programs that truly helped lift everyone’s spirits during these long winter months!